This idea strike my head when I saw my daughter playing with the nail polish. It works for our nail should also works for our toy cars. Why not do some experiment to find out the answer. 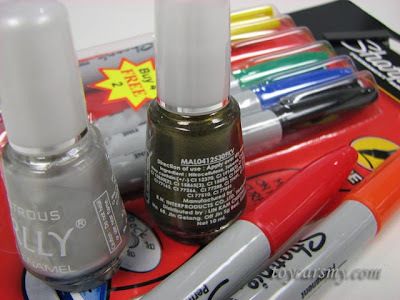 Bought some nail polish from ladies department store and CD markers. The colours I bought are silver and golden-ish brown, markers looked for the one with red and orange colours. After few rounds of painting, and patient waiting, here is the outcome. A enhanced version Civic Si with coloured head lights and carbon bonnet and spoiler. How do you do carbon hood? Thanks for your informative post. Others might want to check out this singapore shopping directory for details. Great range of shopping outlets to visit.